Summary (Goodreads): Meet Mookie Pearl. 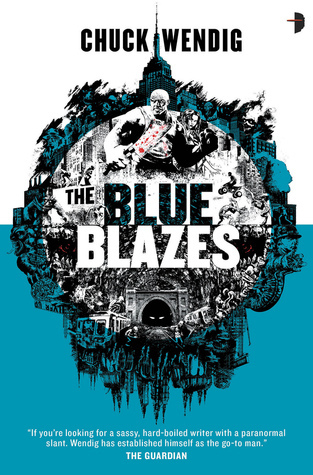 The Blue Blazes kind of reads like a Mafia novel with a supernatural element thrown in. It’s mostly pretty awesome. Some parts of it I found a little slow, but there was some major world-building that needed to be done also, and some of that occurred during the slow parts. Quite a bit of the last third of the novel wouldn’t have made any sense without the slow parts. I wouldn’t recommend this one if you don’t like violence, because it’s pretty much a bloodbath for two thirds of The Blue Blazes. Chuck Wendig has a talent for making this seem interesting as opposed to just more gunfights and brawling. Mookie is a machine in a hand-to-hand fight. Just gets in there and wham! someone’s either dead or seriously injured, crying for their mamma. You could actually imagine quite clearly with was happening during the fighting and there was none of the physically impossible moves that sometimes sneak their way into these things. The whole Five Occulated Pigments subplot was really rather intriguing and it will be interesting to see how these are played out in further novels. There are some other great little gems in this as well. Mookie is a connoisseur of charcuterie (which is essentially smoked meats and sausages and things) and even makes his own sometimes. A rebellious girl-only gang known for their roller-derby nicknames and personas. A whole secondary story told at the start of each chapter through the journals of fabled Underground cartographer John Atticus Oakes, and quite a few other things as well. The world-building in The Blue Blazes was fairly awesome. The interesting blending of some of the darker and more interesting parts of fantasy and supernatural culture and mythology – everything from Christianity, Ancient Greece and Lovecraft, and many more I can’t name – with the quick-witted, snappy writing style fans of both Chuck Wendig’s novels and blog will instantly recognise, creates an interesting version of New York for the characters in this novel to use as their playground. I would definitely recommend this to people who don’t mind a bit of grittiness to their urban fantasy.